This is not the Pininfarina electric road car. This is the Pininfarina hydrogen track car. Also, not that Pininfarina. The other Pininfarina. But sort of the same Pininfarina. It’s complicated. Tesla threw down a gauntlet a few months back. It would build a new Tesla Roadster, Tesla claimed, that would go from zero to 60 in less than two seconds. That was such a wild claim that no one has managed to even aim for it. Until now. Pininfarina is entering the mix. Yes, that Pininfarina. But also not that Pininfarina. It’s complicated. Of course, a 300 mile range is less than half Tesla’s claimed range on the new Tesla Roadster. On the other hand, the Tesla Roadster doesn’t exist yet, so people can really just go on making any claims they want about cars that aren’t real. But Smart People and Experts have told us that with electric motors and the rate at which technology is advancing, these things are possible. And it’s just going to be the first of a range of vehicles from Automobili Pininfarina, which AN says will mostly be electric (cool) SUVs (blah), which will rival SUVs like the Bentley Bentayga (okay). Those with long memories will surely be thinking by now that I must be going crazy. 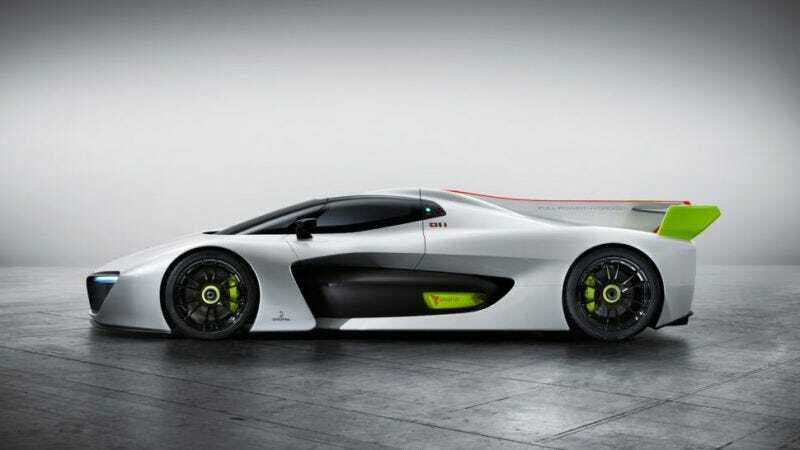 Haven’t we seen a $2 million-plus Pininfarina hypercar before? Didn’t we see this literally years ago? Wasn’t it some be-winged demon that was powered by hydrogen, not electricity, and it looked exactly like this? Let me explain. Pininfarina S.p.A., the Italian design house and the “Pininfarina” you know and love as the designer of both Ferraris and Coke machines, sold a 76 percent stake to vast Indian conglomerate Mahindra in 2015. Now that Mahindra effectively controls Pininfarina S.p.A., the design house, it started up a separate company, Automobili Pininfarina, that it would own entirely. So there you go. Pininfarina S.p.A., the design house, will continue to design things (including cars) for all sorts of people. One of the companies it will design cars for is Automobili Pininfarina, which has an extremely similar name, and which is its sort-of-but-not-quite-entirely corporate sibling. Automobili Pininfarina will make electric cars. Pininfarina S.p.A. will design things that include, but are not limited to, electric cars. But also other cars. And things that are not cars. We can’t wait to see what this car will look like, though.